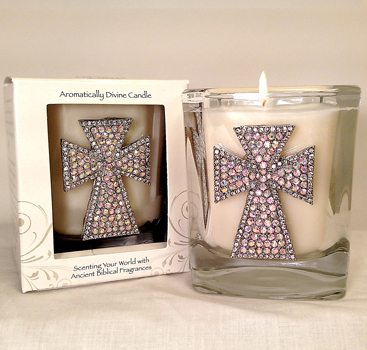 Get this stunning "Angel" Cross candle, poured in Abba's SPIKENARD fragrance. The cross was designed with a myriad of shimmering, iridescent stones to bring to mind the angels magnificent declaration "..a Savior has been born to you; he is the Messiah, the Lord. (Luke 2:11). Container measures 3.75 x 3.75.